One man's quest for the ultimate road trip vehicle. Within the first four years of owning his 1947 Cadillac, Louie Mattar had installed a shower (with the water piped around the exhaust manifold to heat it), a bar with spigots for whiskey, water, and soda, a washing machine, a stove, a kitchen sink, a hookah, and a driver-seat microphone connected to a speaker under the hood, for offering suggestions to other drivers on the road. But he wasn’t finished. 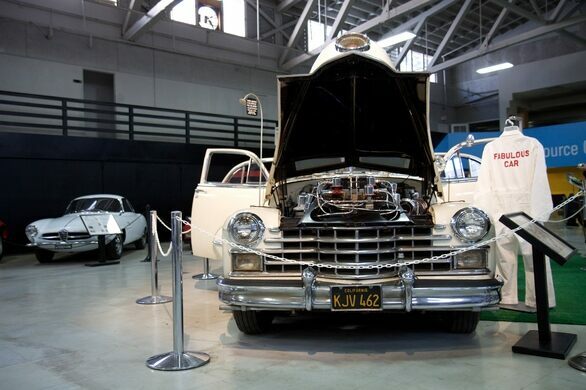 This car, along with a trailer, which Mattar also custom made, is now in the San Diego Automotive Museum. The car and trailer were loaded with amenities for a 7-day, 6,320-mile trip from San Diego to New York and back. He and two other drivers took shifts and didn’t stop the car a single time during the record-breaking trip at the end of September, 1952. He rigged an apparatus that allowed tires to be changed while the car was moving. They refueled three times alongside moving gas trucks at airfields in Kansas City, Camden, and Omaha. The car was designed to automatically refill the radiator and change the oil from reserves in the trailer. The car weighs 8,500 pounds and holds 50 gallons of water, with an additional 30 gallons in the trailer. There are special axles drilled to allow the tires to inflate, if low on air, while they’re turning. The trailer holds 230 gallons of gas for automatic refueling, too, which is how they got by with so few airfield detours. It took Mattar about seven years and $75,000 to complete the dream car. The freeway that never was.